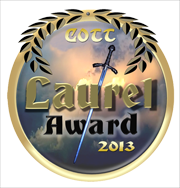 Submissions are now open for Clash of the Titles' annual Laurel Award contest! What makes us different? In our contest, entries are read and scored not by industry gatekeepers but by READERS. Open to any genre of Christian fiction published in 2012, the Laurel has limited slots available and a submission window ending July 19th. Great prizes and a low entry fee of $10 make entering the Laurel a snap. Don't miss out on this opportunity! subscribing to COTT's blog and “liking” our Facebook page. COTT: The April New Releases Clash Winner! COTT: Clash of April Releases!